Available now to hire - the iPad 4th Generation with Retina display is a high end touch screen tablet with built in Wi-Fi connectivit. The iPad can be used as a Timecode slate application for sound sync or a Vision mixer app for controlling our Blackmagic ATEM video switcher. We have a number of pre-installed Apps for the camera control, mixer control, Teleprompter and digital slate control. 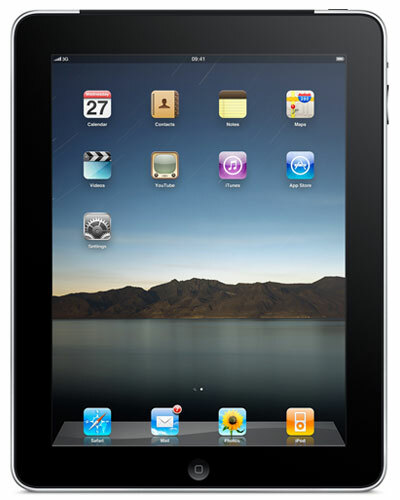 The iPad comes supplied with 32GB Storage and supports wifi 80.11a/b/g/n and Bluetooth 4.0. The iPad is also useful on set with a digital slate application for synchronising multiple cameras if you don't have genlock or for music video production to play out audio tracks with timecode, or to read a copy of your script or just catch up on the weather or news. You can also use the iPad as a tele prompter too with our pre-installed Telepromoter App coupled with our Teleprompter kit. If you sync up with iTunes you can copy videos to the iPad for matching shots on set too - making it a great directors tool. This iPad has a 9.7-inch (diagonal) LED-backlit Multi-Touch Retina display with 2048x1536 resolution at 264 pixels per inch (ppi) and comes with useful production application pre-installed. The iPad is fitted in a tough rubber frame and shipped in a hard Peli shipping case and is supplied with a USB charging cable with a mains power adapter and car charger adapter.